2019 is already off to refreshing new start! This year Santee Cooper has taken on a new rebate structure for all residential solar customers. The first 150 customers to go solar will receive a rebate of $1,200/kW, the next 151-200 customers will receive a $900/kW rebate, and those 200+ customers going solar will receive a rebate of $600/kW. In addition to these great rebates, Santee Cooper customers will recieve energy credits as listed in the Distributed Generation Rider. You can find more information on that here! Going solar in South Carolina has it's benefits! In effort to take some of the pressure off of making the switch to solar, there are many different incentives and credits for solar customers to take advantage of including tax credits. 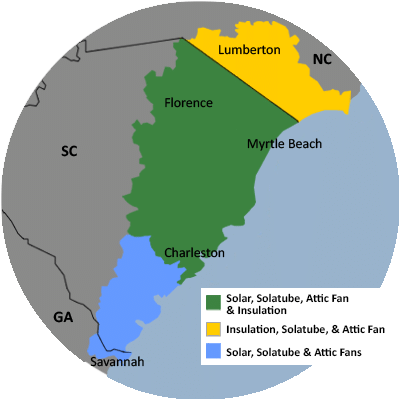 Solar customers will recieve a one-time 25% South Carolina state tax credit and a one-time 30% Federal tax credit; for a combined tax credit of 55%! Not only is solar energy great for the environment, but its great for your pockets as well. To learn more about solar tax credits, click here. SO, WHAT ARE YOU WATING FOR?! For more information about Santee Cooper's Solar Program, click here.